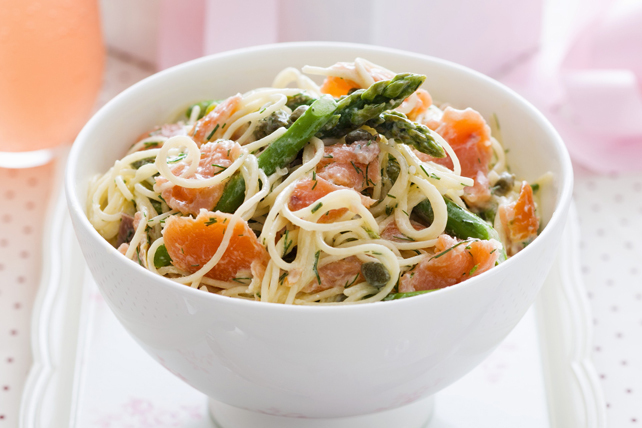 This colourful fresh pasta dish is great recipe to prepare any night of the week. Cook pasta in large saucepan as directed on package, omitting salt and adding asparagus to the boiling water for the last 5 min. Meanwhile, cook pasta sauce in medium saucepan on medium-low heat 3 min., stirring frequently. Add fish and lemon zest; simmer 3 to 5 min. or until heated through, stirring frequently. Drain pasta mixture; return to pan. Add pasta sauce mixture; mix lightly. Top with 2 Tbsp. drained capers before serving. Stir 1 Tbsp. chopped fresh dill into pasta sauce mixture before tossing with the drained cooked pasta mixture.